There are many ways that lead to fame. Some are intentional through excellence in work, some are accidental while others are simply by birth. Well, of the several hundreds of people who have become famous through their relationship to another person is Mandi Gosling. Her claim to fame comes through The Notebook star, Ryan Gosling, one of the famous and most admired active Hollywood actors in modern time. She took her claim to fame further in 2017 when she appeared at the Academy Awards with a very noticeable cleavage, since which she has become the talk of the town, almost on par with her globally recognized brother. With our curiosity sparked about Mandi Gosling, we take a further look into who she is and her life thus far. Sibling rivalries are fun, particularly when they are harmless. It is camaraderie between two or more people who share a lot more than their proximity to each other and memories that will abide with them for a lifetime. 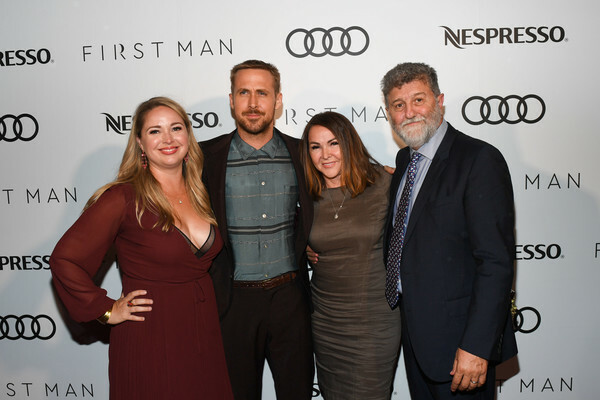 It is, therefore, no surprise that well into adulthood, Mandi Gosling and her brother, Ryan still share love and support for each other when the latter brought his sister as a date to the prestigious Academy Awards in 2017. That beautiful relationship began on the 1st of January 1977 when Mandi Gosling was born as the elder sister of Ryan Gosling, who was himself born three years later. She was born to Donna and Thomas Gosling in London, Canada where she was raised by her parents who were a high school teacher and a salesperson. Mandi and Ryan learned to have one another by their side when at an early age, they suffered the unfortunate separation of their parents and were raised by only their mother. Together with Ryan, Mandi Gosling embraced art, with her learning ballet and singing while her brother dazzled on stage plays. When the time for college came, Mandi Gosling headed off to California State University Northridge where she studied Journalism and Political Science. She graduated from the school in 2011. However, she did not pursue a professional career in her course of study. No one knows exactly what she did immediately after graduation but over time, she has dabbled in several endeavors, including working as a television producer. About a year after graduation in 2012, she worked on two shows; Miss Advised where she is credited as an associate producer and Dateline NBC where she worked on one episode and was credited for the same role. Mandi and her brother during a press event. By now, you have an inkling that Mandi Gosling has some experience working behind the camera. Well, apart from producing, she has done a bit of work as a casting director. She most notably worked on one of the best and most popular songs of the 2010s, Happy by Pharrell, serving as the casting director for the music video of the song. So, if you enjoyed seeing certain personalities in the video, your appreciation goes to her. In modern times, if you are a creative or an entertainment person, it goes without saying that you should have a YouTube channel. Well, Mandi Gosling has one and she has taken advantage of it to post videos of some of her work and materials from her time in California State University Northridge working on the show, On-Point. Having established her extensive experience working behind the camera, we can also say she loves being in front of it too, especially on the red carpet. While many are still talking about her appearance at the 89th Academy Awards, Mandi has made some stunning appearances at other red carpet shows like the 2006 Gotham Awards, and several premieres of her brother’s films like Fracture, Lars and the Real Girl, Half-Nelson. We all know how tough college can be, it can be hard to focus enough to earn a great result but Mandi managed to not only achieve that but did so in an exemplary fashion that earned her the Judge Julian Beck Award.